Sunset over Mindil Beach (photo: Sean Fennessey). The Northern Territory is the Australia the world thinks that we all live in… and don’t. Everything’s a whole lot different up here, and here’s how you can tell that you’ve arrived. It doesn’t matter how pale or skinny the bloke next to you in the bar is; he’s got a heck of a croc story to share, just you wait and see. Since 1986, Australians have been lapping up the global attention and affection unleashed by Crocodile Dundee, before returning home to our apartments in the city where we hope to hell we don’t see a spider (Australia is one of the most urbanised countries on the planet). But up here, Croc Dundee does exist; in fact, he’s all around you… he’s probably sitting in front of you right now. Get anyone talking who’s been here longer than a dry season and you’ll hear croc encounters that would leave Paul Hogan slack-jawed. They’ll tell you they don’t have a sentimental bone in their bodies; but no time is more revered around Darwin than sunset. 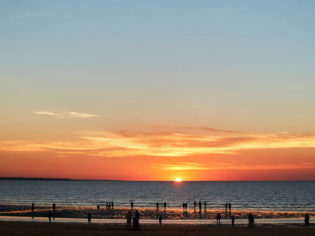 Forget the evening news or Family Feud; each day at around six, Territorians pack out the beaches and foreshores to watch the sun dip into the Arafura Sea. The most famous viewpoint is at Darwin’s iconic Mindil Beach Markets, held every Thursday and Sunday evening during the dry season, where thousands congregate as live music plays. But if you’d rather escape the crowds, head just round the corner to the Darwin Ski Club or the Darwin Sailing Club. If you thought lining up for the Louvre proved you’re the arty type, you’re going to have to try a lot harder in the Territory. The best art up here has been created by Indigenous Australians for over 50,000 years. Take a ferry from Darwin to Tiwi Design on Bathurst Island and spend time with artists in this remote Indigenous community two hours’ boating time north of Darwin. Watch locals paint, screen print and carve and join in special art workshops. Tours leave Darwin every Thursday and Friday from April to December. Or take a charter plane to Arnhem Land and see ancient art still visible on remote caves. Some of the best can be seen at Davidsons Arnhemland Safari Lodge. The Northern Territory is home to some of the best open water, river and estuary fishing on the planet. But there’s something you need to know before you go; this kind of fishing doesn’t come without its risks: nowhere in the world is fishing such a contact sport. No matter where you throw out a line, you can be sure there’s something lurking that thinks you’re probably just that bit tastier. There are few places to fish free from saltwater crocs, and the bull sharks jump clean out of the water in these parts. Watch out for blue-ringed octopus, too. Whether it’s blue-water, estuary or even billabong fishing, it’s best you keep your wits about you. Commercial airlines aren’t much good to you up here. Where you’re going, you’ll need to charter your own propeller plane. Unless you have the time for long, uncomfortable four-wheel-drives across hundreds of kilometres of unsealed bush roads, there’s often no option but to take a charter flight. But that’s a big part of the experience in the Territory; you’ll land on isolated, red-dirt airstrips in the middle of nowhere, built just a few hundred metres from your lodge. All the best lodges up here come complete with airstrips. More bombs fell on Darwin in WWII than on Pearl Harbour (source: many and varied). By sheer number of bombing raids, this doesn’t seem totally out of the question. Darwinites drink more iced coffee than beer (source: Robert Marchan on Tour Tub). The “beer is God” perception of the NT is legendary, but I didn’t see that much of it personally – and a whooole lot of iced coffee. There are more restaurants than pubs (source: learned local friend’s friends). Yes, I’d say this is true by the sheer weight of outlets vs pubs. Inmates at Fannie Bay Gaol were freed during Tracy and the bombings (source: Tony on the Tub). The bombings? Yes, they were all pardoned by the government. For Tracy? It seems unlikely to set them out when indoors is best. Larrakeyah is the site of a mass burial after Tracy, kept secret from the rest of Australia (source: various). It seems far fetched, but then again the official death toll of 66 for a town the size of Darwin seems a little thin. Luckily we got the okay at the UFO capital at Wycliffe, NT. The cynical among us may question why, if super-intelligent beings from another planet were to come to earth in order to check out what humans are up to, they’d choose a tiny roadhouse in the middle of the desert as their main point of reference. However, even the most ardent non-believer would have to admit that, over the years, a disturbingly high amount of UFO sightings have been reported from one little Northern Territory outpost on the Stuart Highway. Whether this is due to people in the middle of nowhere tending to go a little stir crazy or the fact that pretty much the only thing to do out this way is drink copious amounts of alcohol is unclear. There has to be some explanation, however – UFO nuts have rated Wycliffe Well as the fifth biggest hotspot in the world. To say that the owner of the local roadhouse has leapt on this gimmick with enthusiasm is a categorical understatement. Lew Farkas has turned his modest establishment into a hilariously garish holiday park. Just in case you weren’t aware that there might be a bit of extraterrestrial activity, Farkas has plastered his property with alien paraphernalia. The walls are covered in UFO, planet and night sky murals, and there are big plastic green men all over the place. There’s a decidedly manmade looking “spaceship” on what passes for a lawn, and cautionary road signs warn that potential UFO landings might present a slight hazard. Whether it’s genuinely where aliens are planning to take over the world from or a stroke of marketing genius, if you’re taking on that long, lonely trip up the middle of Australia, Wycliffe Well’s flying saucer shrine provides a welcome source of light relief. Wycliffe Well is 375km north of Alice Springs and 135km south of Tennant Creek on the Stuart Highway in Central Australia. If for some reason you’d like to spend a bit of time chilling out in the virtually attraction-free holiday park, you can book online or call 1800 222 195, (08) 8964 1966.